Edwin Tappan Adney was one of the first photojournalists to pass through British Columbia. As a writer for Harper's Weekly, he was sent with his camera to the Yukon via Victoria in 1897-1898. His classic, illustrated book about the Yukon contains a good section on outfitting in Victoria. Numerous editions were printed, plus a modern reprint from Ye Galleon Press in 1968. He returned to briefly report on the Nome Gold Rush in 1900. Born in Athens, Ohio in 1868, he retired first to Montreal, then to New Brunswick where his wife had been born. Tappan Adney was married to Minnie Bell Sharp (1865-1937) of Woodstock, New Brunswick in 1899. She was a pianist and singer who managed the Victoria Conservatory of Music in British Columbia in the 1890s. As the daughter of Francis Peabody Sharp, a famous horticulturist of New Brunswick, she conducted the Woodstock School of Music for many years and ran for federal office in 1919. He died in Woodstock, New Brunswick in 1950. Tappan Adney and his wife are well-remembered in New Brunswick where he gained respect for attempting to preserve the knowledge required to build birch bark canoes. Adney made more than 100 one-fifth scale models of different types of canoes which are now kept at the Mariners' Museum in Newport News, Virginia. Adney also became a student of the language of the Maliseet First Nation. 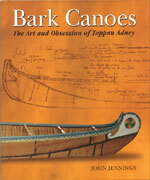 Adney is the subject of Bark Canoes: The Art and Obsession of Tappan Adney by John Jennings. The Klondike Stampede, by Tappan Adney, Special Correspondent of Harper's Weekly in the Klondike (New York: Harpers, 1900; Ye Galleon Press, 1968). [BCBW 2004] "1900-1950" "Photography" "Transient" "Klondike"